Download A Dog's Purpose in Digital HD from the iTunes store. A Dog's Purpose images are © Universal Pictures. All Rights Reserved. 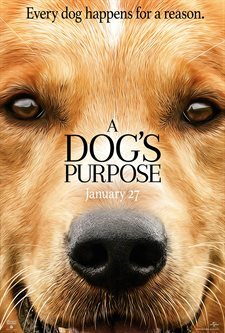 Retelling a story from a unique perspective, and opening the audience's eyes to human nature through the voice of man's best friend, brought A Dog's Purpose to life - captivating the audience through laughter, love, and tears. Director Lasse Hallström (Chocolat) has created a masterpiece based on W. Bruce Cameron's 2010 novel of the same name. A Dog's Purpose is an emotionally touching story that one should not miss. This is the story of a dog (Josh Gad; Frozen) who is reincarnated five times. In each life, he tries to find his purpose for living. Is it fun? Is it food? Is it work? Not all his lives are pleasant but along his journey he manages to make deep emotional ties, especially to Ethan, a little boy who needed the dog he named "Baileybaileybaileybaileybailey" as much as Bailey needed Ethan. Throughout his five lives, "Bailey" is reincarnated into different breeds of dogs but always seems to remember Ethan, no matter what befalls him along the way. Josh Gad provided the voice for the dogs throughout the film. His lines were both humorous and deeply insightful throughout the film. "I think I'll keep this boy" was a phrase that set the tone of the movie. Gad was consistent as a narrator throughout the film and was a constant that kept reminding the audience that beloved pets have a purpose in life that's just as important as our journey. Throughout the film, Ethan grows from a little boy (Bryce Gheisar; Walk The Prank) to a teenager (K.J. Apa; Riverdale) and, finally, to a grown man (Dennis Quaid; The Day After Tomorrow). Gheisar's Ethan is a child and he gives a wonderful performance bringing innocence of the love to the relationship between Ethan and Bailey. When he gets in trouble as a child, you can see the antics clearly and when Gheisar needs to come up with a quick solution in a sticky situation, his performance is classic and recognizable as something a child of his age would absolutely do. Quaid is, as usual, wholesome and down to earth, as he plays the Ethan as a lonely older man, clearly missing out on companionship and love. Quaid's character comes across stoic and fixed - which he needs to be- until he finds his center. Nonetheless, even with such talent as Quaid and Gheisar, they are outshone by K.J. Apa's performance as the teenager Ethan. Apa is an up and coming New Zealand actor who brings to the role his innocence; first heartbreak in life and love, and the capacity to grow far beyond his years, yet fail at the companionship he will need to get through life. Apa's interactions with Bailey are real and every emotion and feeling he has for his best friend shines through in his performance. It's almost as if the absolute connection between Ethan and Bailey was forged during these years. Britt Robinson (Tomorrowland) plays Hannah, Ethan's teenage love interest. She exudes the sunshine that is needed for this role. "You should teach your dog manners" she remarks after Bailey sniffs under her dress when meeting Ethan for the first time. Robinson portrays the flirtiness needed for a teenage girl and takes us through the romance without overpowering the role. Much controversy surrounds the dogs that were used in filming and it's been proven that much of the "news" presented was false. The dogs that played Bailey and all the other pets used were remarkable actors and without them, A Dog's Purpose would have no purpose. Director Hallström did an incredible job, along with Producer Alan C. Blumquist, Screenwriter Cathryn Michon and novelist Cameron bringing life's perspective to the audience from an unlikely source. The humor was well placed and funny enough to make the audience laugh and chuckle. They provided a serious perspective on reincarnation without venturing into the darkness. The background music was almost imperceptible, enhancing the storyline and film. The music beckoned you to each new life, each new relationship. This films set an example as to how a film should present the storyline and dialogue without being overpowered by music. A Dog's Purpose is quietly emotional and teaches some important life lessons with humor and tears at the same time. Don't pay attention to the rumors and listen to the facts- this is a movie that needs to be watched and needs to be listened to closely. Its message is clear- sometimes it's worth living a thousand lives until you get it right and find those you love over and over again. I want to see this SOOOOOOOO MUCH!